Interval International has announced that the Secret Garden and Pavillon du Golf in the exclusive Palmeraie area of Marrakech, Morocco, have joined its global vacation exchange network. The resorts are conveniently located near the old town area, a UNESCO World Heritage Site, yet also offer visitors the chance to enjoy a modern city filled with cultural offerings. The 15 riad-style or traditional palace-like residences of Secret Garden are set in a palm grove overlooking the edge of the golf course. The freestanding villas include a full kitchen, living and dining room, three bedrooms, a pool with a sauna in the interior courtyard, and a panoramic terrace. The 44 contemporary apartments of Pavillon du Golf also have views of the golf course. With traditional tadelakt and carved cedar Moroccan furniture, the Spanish-Moorish style units have a living room with fireplace, one or two bedrooms, and a balcony or terrace. Owners and guests have access to all the resort facilities, including the 50,000-square foot (5,000-square meter) Palmeraie SPA, the 190-acre (77-hectare) Robert Trent Jones Sr. Palmeraie Golf Club, and nine themed restaurants and bars, as well as outdoor pools, tennis, and a kids club. 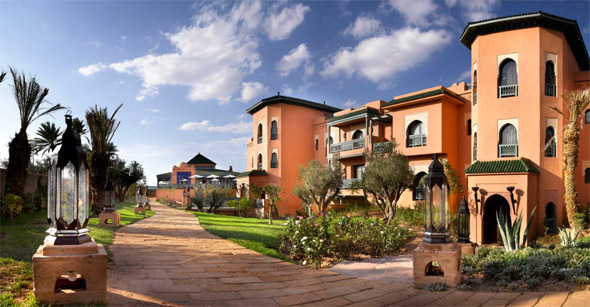 In addition to the on-site amenities, Palmeraie Resort is close to popular historical sites in Marrakech, including Koutoubia Mosque, Majorelle Garden, and the Saadian Tombs.